In my graduate research, I seek to build upon current scholarship on partnered social dance and gender studies, a discourse that is changing among practitioners and one in which I am engaging directly as an active participant in international Zouk dance communities. In my thesis performance project I am deconstructing both the movement and culture of these communities and commenting on them by working interdisciplinarily, interactively and site specifically. It Won't Buy You Lunch is an evening-length work about artists embracing the part of themselves that has to make art in a world in which it doesn't make sense. IWBYL is a collaboration between SSDP dancers (Stephanie Chun, Elisabeth Martin, Leigh Schanfein, Anna Schon), Open Music Ensemble musicians (Nicole DeVault, Kaveh Haghtalab, John Murchison, Jonathan Saraga; organized by Philip Foster), inventor-designer Robert Olsen, filmmaker Jaffe DeVault, lighting designer Tracy Wertheimer and costume designer Samantha Gebb. Presented by The Tank at Standard Toykraft in Brooklyn, this three night run will be a perfect send off as Sydney closes the "post-bac in struggling artist" chapter of her career and heads off to pursue an MFA... so make sure you don't miss it! After 6 long (but also very fast...) years, Sydney's taking a break (ish) from NYC. Before leaving, she wanted to give you one last chance to catch some highlights from SSDP's major works, a peek into the new work she'll be developing in grad school as well as celebrate SSDP's incredible multimedia collaborators. Stick around for the after party! Dry Bones: Resurrection of the Living follows the personal journeys of three 21st century individuals striving to take ownership of inherited traditions. The work features Cheryl Krugel-Lee's original arrangement of Antonín Dvořák's "New World Symphony" for string quartet and mezzo soprano incorporating text from Ezekiel 37 (Hebrew), "Dem (Dry) Bones" and Nichiren Buddhism. Using text study and story telling in the Jewish tradition, the collaborating artists of Sydney Schiff Dance Project hope to spark dialogue among diverse audiences. Open Rehearsal #1 - November 30, 5-7pm at Barnard. RSVP required. Open Rehearsal #2 - January 4, 7-9pm at Barnard. RSVP required. ​FULL PERFORMANCE with workshop, dialogue and food! - January 28, 8pm at Judson Church. FREE! America's first ever fashion week flash-mob performance and pop-up catwalk promoting designer Cristina Ruales' collection as part of NYFW! The work features the ethereal antics of some rockstar ballerinas. Performance - Valentine's Day (February 14), 2:30pm on the pedestrian island north of the Flatiron Building. Ask a Vane is an investigation of transition with particular consideration of age and nature and is comprised of a series of improvised "chapters" driven by sets of tasks incorporating movement, music, text and a movable set piece. This new collaboration with choreographer/dancer Katie Cowdery, award winning inventor-designer Robert Olsen and musicians from the Open Music Ensemble (organized by Philip Foster), will be presented as a 20 minute work as part of The Tank's xyz: chain creation winter cycle, a program that challenges nominated artists to create collaborative 20-40 minute works in 3 months. Imagined Architecture is a collaborative multidisciplinary work that takes a look at the stuff of which we, our city and the people with whom we share it are made. It brings together Open Music Ensemble musicians Kaveh Haghtalab (kamancheh), Nicole DeVault (harp and voice) and Jonathan Saraga (trumpet), inventor-designer Robert Olsen, and NYFW ballerinas (gone rogue) Leigh Schanfein and Elisabeth Murray Martin to create something that will define the next chapter in SSDP's perpetual metamorphosis. May 26, 8pm, RSVP on Facebook! March 13 - Inception to Exhibition's March Dance Festival (excerpt). Tickets available here. April 2 - Congregation Ramath Orah (full production) - WOMEN ONLY. Tickets available here! April 10 - Green Space Blooms Festival (excerpt). Tickets available here. May 7 - STUFFED at Judson Church (excerpt). FREE ADMISSION & FREE FOOD! 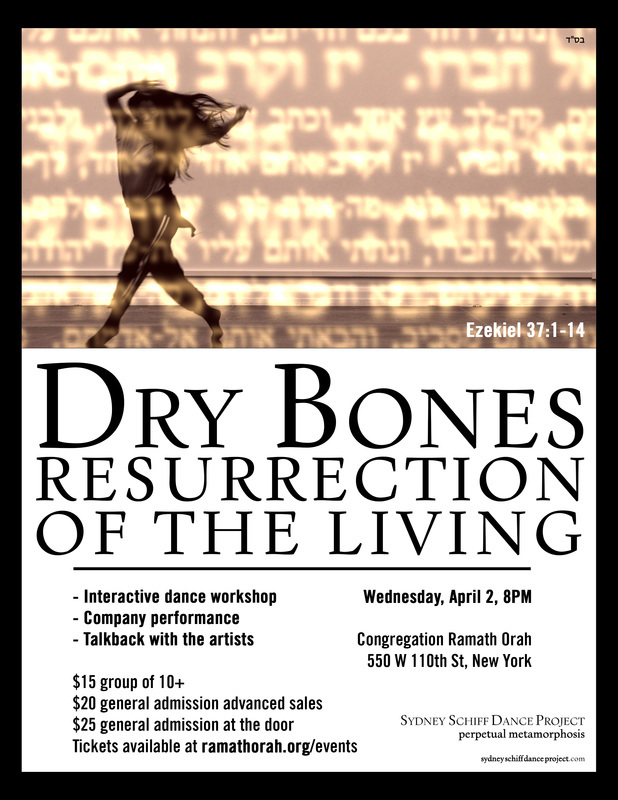 After our first preview at Drisha's End of Year Arts Fellows Showcase in June 2013 at the Manhattan JCC, we lined up a few teasers in preparation for the official NEW YORK PREMIERE of Dry Bones: Resurrection of the Living! And finally... Come celebrate the holidays and SIX MONTHS of performances at our Holiday Party/Benefit Performance on Thursday December 19! Spring 2013 - Fundraising Campaign Success! Thank you to everyone who contributed to our fundraising campaign to support the development and production of Dry Bones! With your support, we exceeded our goal, got the word out there and ensured Dry Bones will continue to grow after we previewed on June 13, 2013 at the Manhattan JCC. For the last 5 years, I have been exploring the relationship between Judaism, Jewish texts and movement through contemporary dance. I spent this past year studying these ancient texts and later commentaries in a full time intensive program. How can I take ownership of this corpus of infinitely rich literature and use it to flesh out my art and my life? Dry Bones: Resurrection of the Living follows the personal journeys of three 21st century women striving to take ownership of inherited traditions. I’ve commissioned an unconventional rearrangement of Antonin Dvořák’s New World Symphony, a masterpiece that is full of stories about people on journeys. Reconciling inherited traditions with life in a diverse modern world is a challenge for all of us. By exploring text study and storytelling in the Jewish tradition, it is my hope that Dry Bones will spark dialogue among all people, no matter their affiliations - religious or otherwise. In the Jewish tradition, the prophet Ezekiel is brought to a valley full of dry bones and prophecies over them to bring about their resurrection. He watches as the scattered bones are drawn together into skeletons, covered with flesh and skin, and filled with the breath of life. In that vein, can we look at the amelioration of our spiritual, emotional, intellectual and interpersonal lives as a process of gathering and re-invigoration? This work is being created in collaboration with composer Cheryl Krugel-Lee and dancers Kate Ladenheim, Kendra Samson and Catherine Jaeger. Over the next year, it is my goal to develop Dry Bones into an evening length work. For now, I am presenting Dry Bones as a 15-minute excerpt that can both stand on its own and as part of a larger work. A danced re-imagining of the Pushkin story to the Prokofiev score played live by the Princeton Symphony Orchestra at Richardson Auditorium, Princeton University. The work featured members of the Princeton Ballroom Dance and Glee Clubs, was directed by choreographer and Program in Dance professor Rebecca Lazier, and was reviewed by the New York Times.